The Island of Capri, Italy is not only a dream holiday destination, it is also the perfect base from which to explore the artistic, historic, and natural treasures located on the other islands of the Bay of Naples and on the mainland coast, all of which are easily visited in a number of fascinating day trips from Capri. 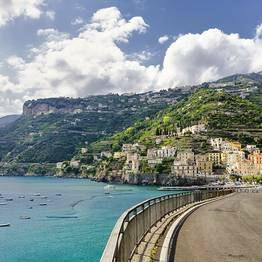 The Amalfi Coast can be reached from the Sorrentine Peninsula by way of the spectacular SS163 highway. In the summer months there are also frequent sea connections from Capri to the main towns of Amalfi and Positano, by small ferry and hydrofoil. 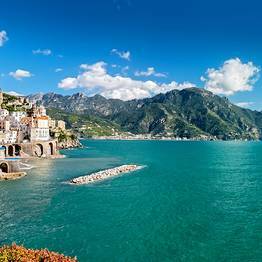 Those who choose to rent a private boat can slowly sail past the hidden coves, inlets, and small villages which punctuate the legendary stretch of coast between Punta Campanella and the Bay of Salerno. 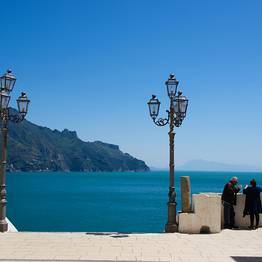 Amalfi is, of course, one of the principal destinations on the Amalfi Coast, and has a historic center rich in churches and period buildings, reminders of the glorious past of the Marine Republic. Close by lie the small towns of Conca dei Marini, Furore, Praiano and picturesque Positano, this last is built on precipitous terraces clinging to the cliff face. Not far from the city of Salerno, the town of Vietri Sul Mare is renowned for its hand-painted porcelain. Traveling along the Amalfi Coast towards Punta Campanella visitors pass by the towns of Maiori and Minori, famous for both their fabulous beaches and delicious pastries. 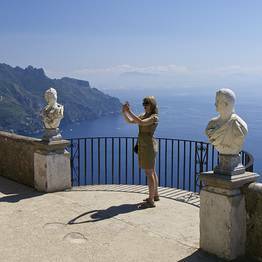 Ideally, an excursion to the Amalfi Coast should include a visit to the Grotta dello Smeraldo and a dip in the sea of the Li Galli archipelago. 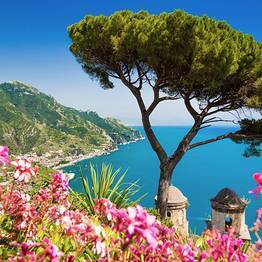 The town of Sorrento is located on the mainland, and is built on cliffs from where it enjoys a magnificent view of the whole of the Bay of Naples. 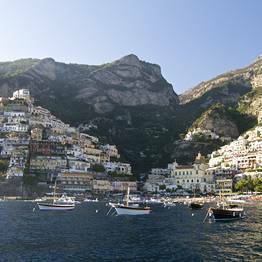 The short journey by ferry from Capri to Sorrento lasts roughly 20 minutes. 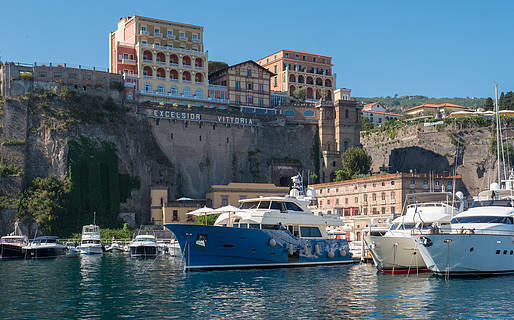 To reach the town's historic center from the harbor of Sorrento, visitors can walk up the flights of steps cut into the rock or take the local bus. As they walk along Corso Italia, visitors soon come to Piazza Torquato Tasso, at the center of which there is an impressive statue of Sant' Antonino, Sorrento's patron saint. 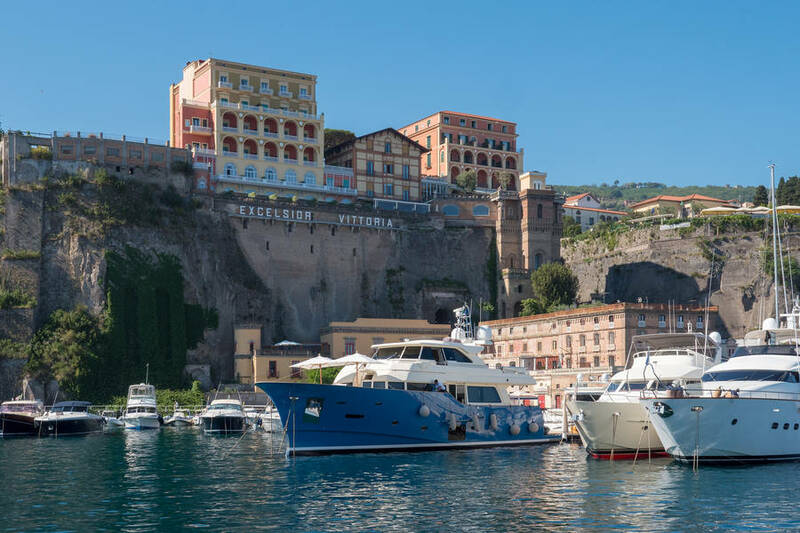 From Piazza Tasso, visitors enter the heart of the historic center of Sorrento: a fascinating maze of little lanes lined with tiny shops and artisans'studios which conserve, unaltered, the character of this ancient Mediterranean port. In the Villa Comunale, not far from Piazza Tasso, tourists walk amidst century old trees, or join the locals taking a rest on one of the many benches facing the sea. 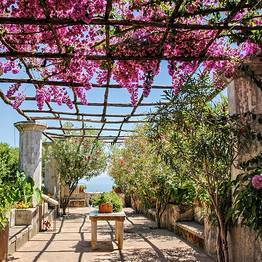 Only a few kilometers separate Sorrento from Castellammare di Stabia, a popular spa town and home to one of the Campania region's most important archeological sites. Near the Collina del Varano, ruins of ancient villas and thermal baths, dated between 91 and 88 B.C., can be seen. Like Pompei and Herculaneum, the ancient town of ''Stabaie'' was completely buried under burning hot tephra ash during the eruption of Vesuvius in 79 A.D..
Whilst in the area, food lovers should head to the nearby town of Vico Equense, famous for its dairy products, to sample some of the gourd-shaped "caciocavallo" or marvelous "Provolone del Monaco" cheese, the latter often left to mature for up to two years. 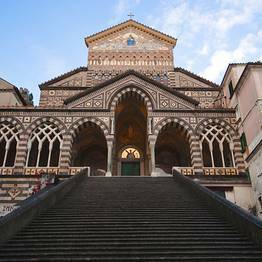 Before leaving Sorrento, visitors should be sure to taste the town's famous Limoncello liqueur. On warm summer evenings, small boats can be seen leaving the port of Capri and sailing in the direction of Punta Campanella, before disappearing behind the profile of the Amalfi Coast. Many of these boats will be headed to Nerano, where the islanders of Capri often go to enjoy an evening meal, comprised of the specialties of the Amalfi Coast. In the small sea view restaurants of Nerano, the very best Mediterranean cuisine is served, prepared according to age old local recipes, using vegetables from the kitchen gardens and fish caught that morning by the local fishermen, and accompanied by one of the excellent wines produced in the Lattari Mountains. 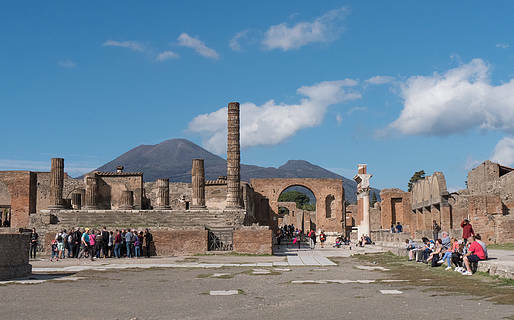 A visit to Pompei and Herculaneum is, at times, an almost disconcerting journey back in time. The tour takes you through streets lined with the aristocratic villas, to markets and baths, which were built by the Ancient Romans, and rediscovered centuries after they were buried under meters of volcanic ash produced by the eruption of Vesuvius in 79 A.D.
Pompeii never fails to astound visitors with the beauty of its buildings and artworks and the sheer size of the archeological site. A number of thematic museum routes have been created to help visitors explore the town's private houses, splendid patrician villas, public buildings, and to gain a fascinating insight into what everyday life might have been like in Pompeii... before the explosion. Like that of Pompeii, the archeological site of Herculaneum can be easily visited thanks to a serious of well planned itineraries through the Ancient Roman town, which was discovered quite by chance in the 18th century. In the first half of the 20th century the archaeological sites of Pompeii and Herculaeum were directed by Amedeo Maiuri, the archeologist who supervised the works carried out at Capri's Villa Jovis. You can often find long lines at the ticket offices of the Pompeii and Herculaneum archaeological sites, especially in summer. The best way to make the most of your visit is to book skip-the-line tickets online in advance, so you can avoid the wait and enter the site as soon as you arrive. 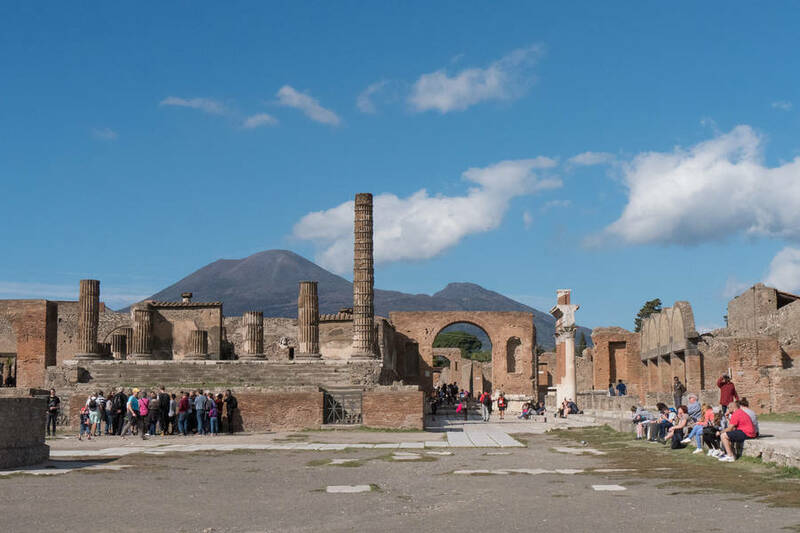 For an especially unforgettable day trip, pair your visit to Herculaneum and Pompeii with a trip up to the volcanic crater of Mount Vesuvius. You can stop for lunch between these two destinations at the Cantina del Vesuvio winery, located on the slopes of Mount Vesuvius. This family-run winery produces Lacryma Christi, a unique and historic local wine, which they served paired with excellent home-cooked traditional cuisine during their lunch tastings. Capri is often referred to as the "Isola Azzurra" (Blue Island), due to the intense azure of the sea which bathes its sea caves and tiny coves, it is only natural, therefore, that Ischia is called the "Isola Verde" (Green Island). Seen from afar, it is almost impossible to spot a single part of the trapezoidal shaped island which is not covered in lush vegetation. 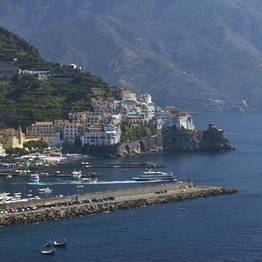 The fishing district of Ischia Porto is the ideal starting point from which to head off on an exploration of all the most enchanting corners of the island. Sauntering through its narrow alleyways and sea-edge lanes, visitors soon reach the Castello Aragonese: an impressive 113 meter high stronghold built on a small islet and connected to the old quarter of Celsa by an ancient stone bridge. 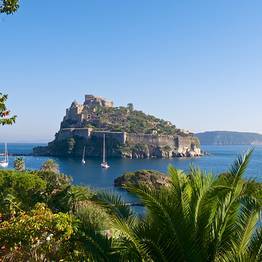 Whilst Ischia's most famous beaches are the Spiaggia di San Montano, the Spiaggia dei Maronti and the Spiaggia del Lido, the island's coast is dotted with any number of lesser-known, yet equally paradisiacal, beaches, all easily reached by boat. At Lacco Ameno there is a massif block of volcanic rock, originating from Mount Epomeo, and which, over the centuries has been molded by atmospheric erosion into the form of a gigantic mushroom. 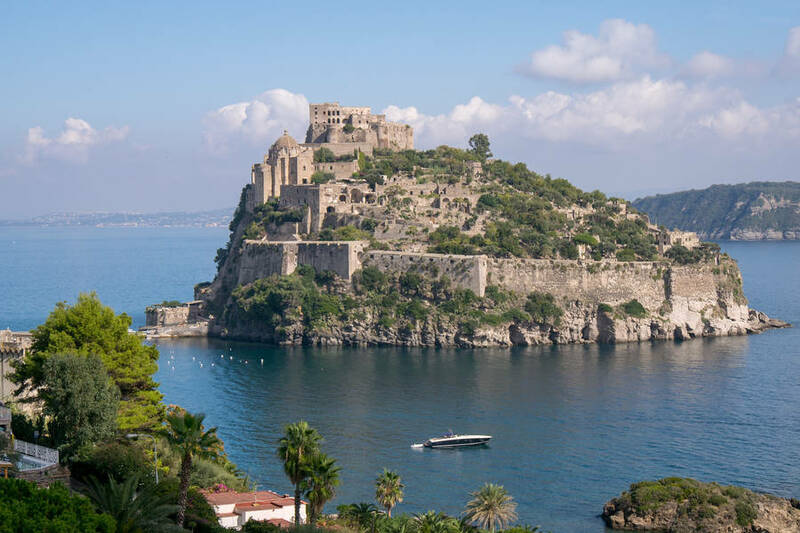 Ischia is famous worldwide for its thermal springs, much prized since the times when the Ancient Romans first discovered the water's therapeutic properties. 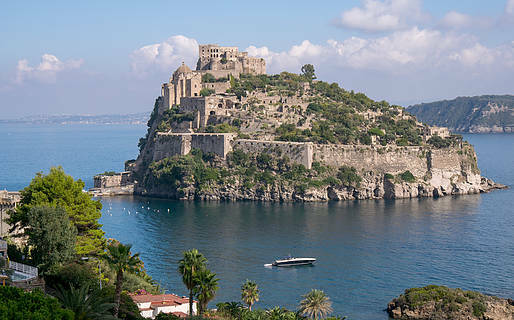 Although the thermal tradition of Ischia was first revived in the 17th century, it was only in the 1960's that it acquired international fame. Today, both resident holidaymakers and day trippers can enjoy the treatments, performed using Ischia's thermal water and volcanic mud, which are available in the island's state-of-the-art spas. Direct ferries between Capri and the other two islands in the Bay of Naples operate on a limited timetable and during the summer months only. 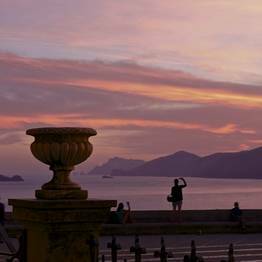 Visitors may find they need to travel first to Naples, from where they can easily board a second ferry to the island of their choice. 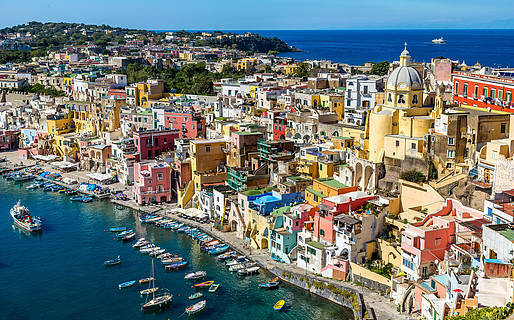 As they approach the harbor of Procida, visitors are greeted by a colorful display of tiny painted houses, which seem to have sprouted up like wild flowers, by the water's edge. The crystal clear seas surrounding the tiny island of Procida were, according to an ancient Greek legend, once the stage of fierce battles between Titans. The medieval historic center of Procida, known as Terra Murata, is reached via a panoramic road overlooking the Marina Corricella. Here tourists can visit the splendid Abbey of San Michele Arcangelo, with its museum and library which contains some 8.000 books. 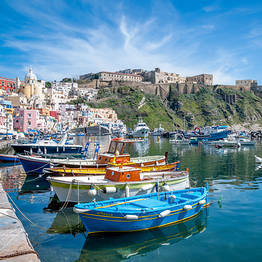 The peaceful island of Procida is the ideal place for those wishing to relax and swim in the beautifully clean, warm sea. The beach of Silurenza is located just steps away from the port of Marina Grande. 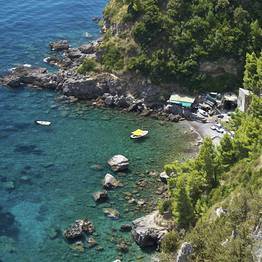 The Spiaggia della Lingua is a small beach, much loved by scuba divers. 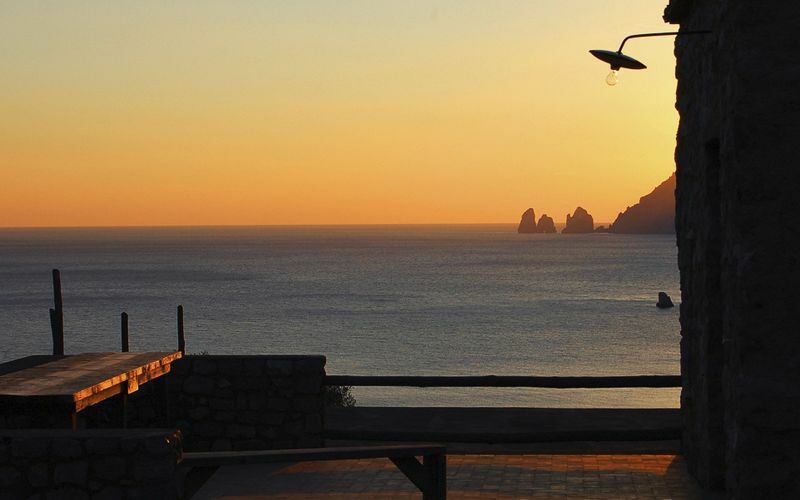 The sun shines on the beach of Ciraccio from dawn until dusk, making it the perfect choice for those intent on obtaining an authentic Mediterranean tan. 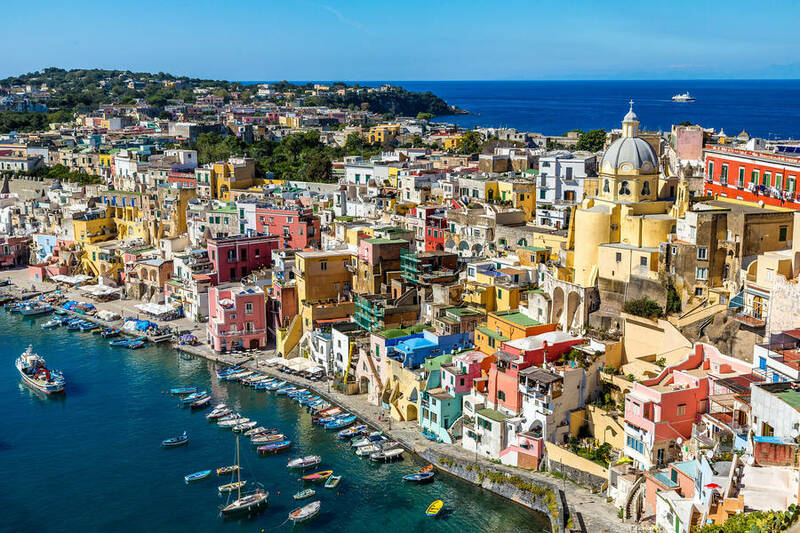 Before heading back to Capri, visitors should be sure to take a stroll among the little cottages, and through the vaulted passageways of Marina Corricella, the old district of Procida, where, historically, the island's fishermen used to live. Here, in this maze of little lanes dominated by the dome of the church of Santa Maria delle Grazie, visitors can still come across fishermen mending their nets after a day at sea. 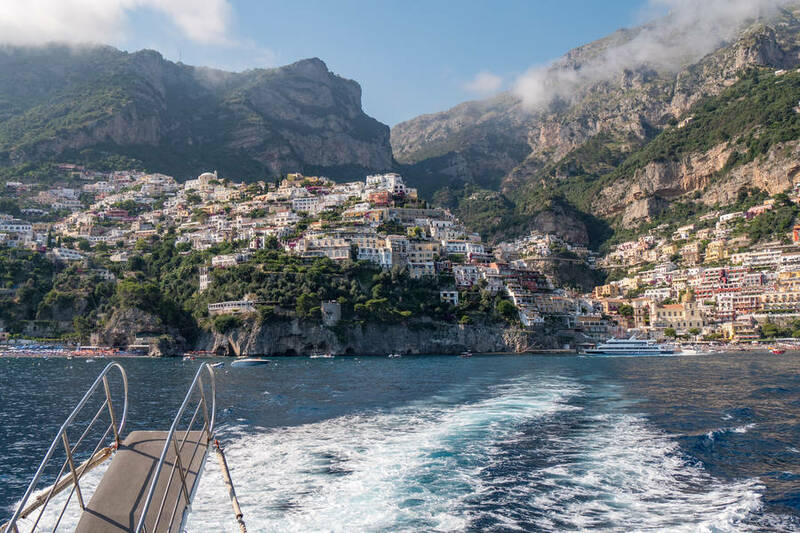 Get from Capri to the best hotels, restaurants, and other destinations in Positano and Nerano with our private taxi boat service via powerful speedboat.